Elizabeth is a self-taught artist who showed signs of her creative talents in early childhood. She began her career in Durham, NC where she sold her works at the Arete Gallery, The Durham Art Council’s annual art festival, and the Botanical Gardens. In 1999, she opened her studio/gallery in the Denver arts district on Santa Fe Drive. 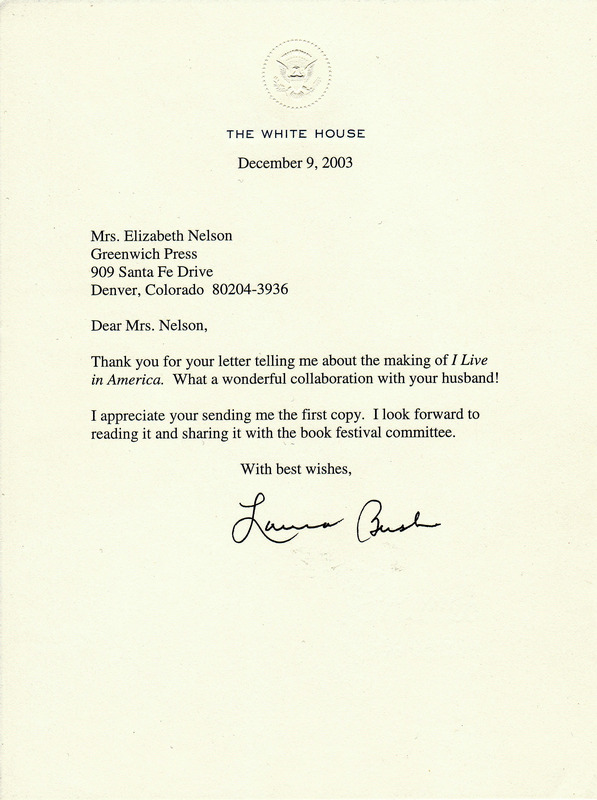 It was there that she wrote and illustrated her two books, I live in Denver and I live in America. She sold the books, the original paintings, and the giclees (zhee-KLAY). The architect who designed the airport bought the original painting of DIA and the airport used the image to print over 120,000 post cards to hand out to foreign travelers. She appeared on all four Denver TV morning shows and her book got glowing reviews in the Rocky Mountain News and the Denver Post. 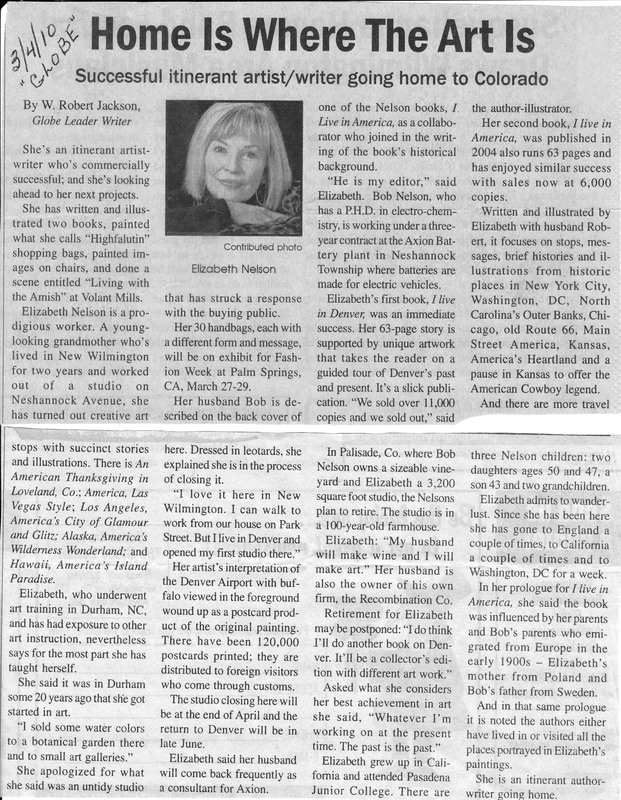 She had book signings at the major book stores and an exhibit of her paintings at the Denver West Barnes and Noble. 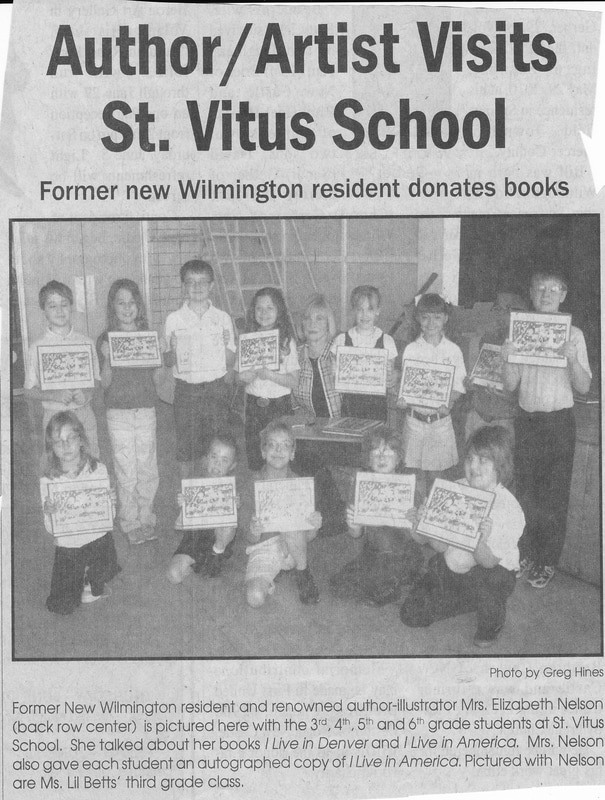 Overall, her first book sold over 11,000 copies. In 2004, she and her husband “bought the farm”, actually a vineyard, in Western Colorado. The plan was that she would make art and we would make wine, but a short time later her husband was offered a temporary assignment in Amish Country in Western Pennsylvania. They decided to take a break from farming and have another adventure. It was in the small town of New Wilmington where she opened her new studio, looking for a fresh approach to her art. In this tiny community of 2,700 people, where half the women wear blue polyester dresses, brown bonnets and black farm boots, she was inspired to star WAG, the Wearable Art Gallery, her new signature. Living in the black hole of shopping, she created her way through the year designing, painting and stitching the Highfalutin Shopping Bags. The concept for the installation is 12 months of shopping bags. Each month has one or two categories; for example, January is “The Time Machine” and “All About Eve”. The Time Machine has four bags in the category, Time Machine, Fast Lane, Slow Lane, and No Lane. All About Eve has Jungen, I am Woman and Madonna…and the months go on. She always saw the completed project as an installation, ending in an auction- “Mission Accomplished”!....just in time to return to Colorado for Spring planting. After 10 years in Palisade they yearned to return to the Front Range in Colorado where they fell in love with Fort Collins. Here, she has done commissioned work and is working on two new series. Wallflower, a contemporary look at bontanicals (Acrylic on Canvas), and a Fiber Arts series, "Portraits in Fiber". Elizabeth's exiting new venture is in the medium encaustics. She is looking forward to having some fun painting with wax.